As readers will have already observed, the names of some people I met and worked with over the years now escape me, however I hope and believe my memory of most technical issues relating to the bikes and work carried out before and during the time we were with Moto Parilla, is still reasonably intact? From memory the following is therefore a summary of the modifications we made to our Moto Parillas and the reasoning behind these modifications at the time. In addition to providing the multi spring racing clutches and 30 mm bore Dell’Orto carburettors, the Eng indicated we had the option and Moto Parilla were willing to assist us in fitting the 5 speed close ratio Moto Parilla gearbox cluster, changing the cam chain drive to an all gear drive and, should we so wish, fit a total loss battery coil ignition system, in place of the CEV 6005 AC Magneto, to the 250 and 256 engines – At this point it is only fair to say neither the Eng or out two assistance thought much of our future prospects for scaling down a 175 Moto Parilla engine to 125 cc !! However they indicated their willingness to assist us in any way they could. Our decision to have the Moto Parilla 5 speed gear cluster fitted, in the circumstances, was a no brainer and having discussed all the pros & cons of chain verses gear drive to the cam, we elected to stay with chain which we believed, at the time, to be reliable and was known to be quieter in operation. The Eng informed us there was no measurable difference in power output from engines fitted with either cam drive system or weight advantage from one over the other. Again whilst the Eng reported some of the top Italian Wildcat riders were using total loss battery powered coil ignition systems he agreed with me this would not perhaps be the best system for us with many International road races on the Continent being of one hour duration or more. Whilst the optional coil ignition system, by doing away with the CEV AC Magneto may have resulted in better acceleration, particularly for a scrambler, I could not risk running out of “sparks” in a long race and I doubted if there would be any weight advantage from removing the magneto and then adding a battery? Dealing with the specific modifications unique to the planned 125, Ron and I came to a very early conclusion the best way forward was to reduce the bore and stroke of the 175 from 59.8 x 62 mm to 54 x 54 mm as this would enable us to use the same cam profile as fitted to the 175/250 MSDS, and there were a number of 54 mm diam racing pistons and close grain graphite iron liners available at the time which could be easily adapted. 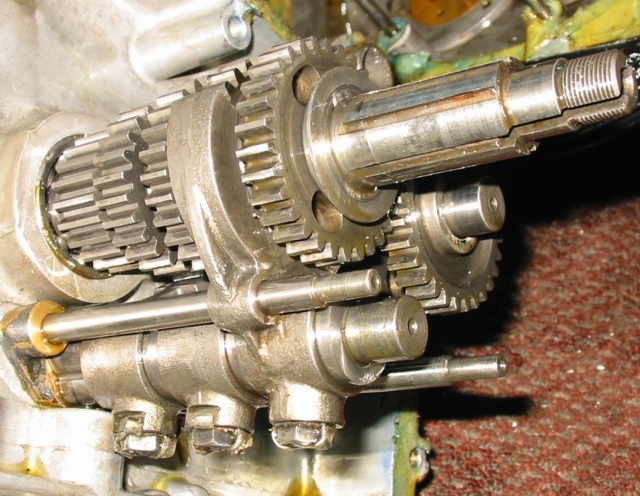 The 54 mm stroke engine required a new longer con-rod (4 mm longer between centres) to avoid dropping the cylinder head to match the revised stroke. Dropping the head would have caused all sorts of complications with the cam location and valve timing. We decided to leave these proposed structural modifications to the 175 engine until my arrival in Milan in part because I wished to discuss the plans with Moto Parilla before implementation and, subject to their agreement, I intended to withdraw two 175 crankshaft half’s from the production process before the crank pin holes were machined in order to have the throw of the crankshaft reduced by 4 mm to give the required 54 mm stroke. This was the plan but for some reason or other we were not able to get hold of the required crank shaft halves at the time and therefore decided to stay with the 62 mm stroke and to reduce the bore of a standard 175 barrel further than originally planned. This was achieved after much time spent searching for a suitable piston, con-rod and a proprietary cylinder liner. Having machined the new liner to fit into the 175 barrel it was secured into position by first freezing the liner and then placing it into the pre heated barrel. We then re bored and honed the modified barrel to match the new piston – which was either Morini or Mondial. Ultimately Ron and I wanted to replace the 125 cast Iron barrel with an alloy barrel fitted with a close grain graphite iron liner, this would have reduced the engine weight considerably and with a cooler running engine may have permitted us to run a higher compression ratio with a gain in BHP? – Regrettably, we never found the time to carry out this planned upgrade. With the requirement to split the 175 crankshaft to fit the longer con-rod, we took this opportunity to re machine the crank half’s removing material from the counter weights. This helped to both lighten and re balance the crank to match the smaller and lighter new piston and con-rod. Looking back it all seems so simple now, but I can assure you this was not the case! The 125 engine conversion took up over 50% of our total time at Moto Parilla and I cannot now for the life of me understand why we did not just plug the crank pin holes in a standard 175 crank and then re-drill the holes 4 mm closer to the crankshaft centre just as Ron Kenward did later in the year. This would have saved us so much time and trouble and would have resulted in us having a better performing engine months earlier! From time to time our assistance would leave Italian motorcycle mags on our work benches showing 125 cc Ducati, Morini and Mondial racers for sale – we suspected in the hope that we might be encouraged to take an easier option than building a 125 Moto Parilla? Fitting a Moto Parilla 5 speed gearbox cluster required the engines to be completely stripped down to enable the crankcases and gearbox/clutch bearing housing to be machined. The R.H side case then having a small bronze selector fork guide pin locator block mounted inside the case. The L.H side case required a large segment of the gearbox bearing housing aperture to be machined away to enable the 5-speed cluster to be fitted and removed without requiring the cases to be split. Fortunately we were able to leave our assistance and the Moto Parilla machine shop operators to do most of this work whilst we got on with the 125 engine conversion and modifications to the cycle parts of all three bikes. Whilst the engines were all stripped down our assistance took the opportunity to check the oil pumps as it would appear Moto Parilla introduced a pump upgrade during 1963. One of our engines was found to still have the older type pump and this was immediately replaced. There were a number of options for us to consider when it came to cam profiles, lift, valve springs, push rod types and other modifications, in addition to the modification we had already made to the inlet port of the 175 head for the 125 engine, these included the option to fit X1 or the later X2 profile cams with lifts ranging from 7 mm to as high as 9 mm – taking the advice of the Eng we opted for the X1 cam with 8 mm lift for the 250 and 256 cc engines and again the X1 cam but with only a 7 mm lift for the 125. We agreed with the Eng that our choice of these options should make the engines more durable even if we lost a little top end power. In the case of the 125, by using a modified 175 head we were already “well over valved” and therefore did not need any cam with a lift higher than 7 mm. With all three engines we decided to fit roller main bearings on the drive side and deep ball bearings on the dyno/mag side – the Hoffman roller bearings we selected with their machined manganese bronze cages were rather special and we were informed, very expensive compared to the normal bearings Moto Parilla fitted to the MSDS engines. During 1962/63 Moto Parilla had also introduced new valve springs on the MSDS model with a small increase in the overall diameter of the outer spring. This apparently led in some instances to interference and ‘chaffing’ between the springs and the spring recess in the head castings – the solution to this was to open up the head casting spring recess in production when machining the valve guide holes – with our engines we found only one had slight spring/head interference and this was quickly rectified. We were advised by the Moto Parilla mechanics to just throw the rocker arm return springs away claiming they were only fitted to reduce the valve and cam gear noise at start up when engines were cold, having no impact what so ever on engine performance. We were given 3 or 4 options when it came to valve spring compression rates with each spring group being clearly marked with different colour strips. Again taking the Eng’s advice we opted for one of the spring compression rates from the middle of the range but also took along 6 engine sets each of the other spring options as spares. All of our engines were fitted with titanium valve collet retainers which required all valve spring end faces to be very carefully ground and polished to prevent spring to collet retainer chaffing. We had already decided back in the UK to reduce the inlet valve head diam from 36 mm to 35 mm and the exhaust valve from 33 mm to 32.5 mm for the 250 and 256 cc engines and we proceeded in having 6 or more sets of valves modified to these dimensions in the machine shop – we recognized that with thinner valve seat contact areas we may be required to dress the valves and seats more frequently but as it was already our intention to check valve to rocker clearances after every race and practice session and to lift the heads if there was any sign of deterioration, we felt having smaller and lighter valve heads would be an advantage. Ron Kenward had already demonstrated to me how he ‘hand dressed’ rocker arms back in the days he was campaigning a four valve Rudge and his Excelsior Manxman and I brought the set of 175 Moto Parilla rockers Ron had dressed back in the UK to Milan – You can therefore imagine my surprise and delight when one of our assistants walked into the race shop and showed us a set of rockers he had dressed at the factory which looked virtually identical to the ones Ron had prepared. A week later one of our assistants arrived in the race shop with a set of alloy rocker arms which appeared to have been machined from billets and with 2 sets of alloy push rods with steel capped ends – The alloy rocker arms were manufactured by an outside supplier and there was apparently only the one set now sitting on my work bench available. The alloy push rods were manufactured, it was claimed, by Moto Parilla some time in the past and these 2 engine sets were the last they had in stock. After consulting with the Eng we decided to fit the alloy push rods into the 125 only, keeping the other set in reserve. Later when we assembled the 250/256 heads we tried fitting the alloy rocker arms to the 250 engine but found that even after extensive fettling of the heads there was very limited clearance in several areas. We therefore decided to stay with our dressed steel rocker arms with the intention of testing the alloy arms later when a suitable opportunity arose. Working on the 250 and 256 engine cylinder heads, we fettled the inlet ports in accordance with Phil Irving’s recommendations – all as illustrated in ‘Tuning for Speed’ We also had to open up and blend the entry of the inlet port to match up with the bore of the 30 mm Dell’Orto racing carbs – this operation on a Moto Parilla head requires considerable care to avoid breaking through into the valve spring recess oil drain hole located in the head casting passing down very close to the port in some head castings! Apart from removing any irregular machining or casting marks, we did not modify the exhaust ports or the combustion chambers of the heads in any way. The Eng strongly advised us use a semi synthetic Shell S.A.E 40/50 racing oil and NOT to add any Bardahl which many riders were using in their bikes at the time. During the previous three years I had been contracted to Castrol Oil and was proposing to use Castrol ‘R’ in my Moto Parilla engines but we took the Eng’s advice and only used the recommended Shell oil through out our 1964 campaign. One of the most interesting things we did find in ‘Aladdin’s’ cave was a 175 or 250 high cam crank case with a prototype oil pressure driven chain tensioner mounted in place of the normal spring tensioner – this prototype unit which consisted of an alloy block ‘piston housing’ a little smaller than a standard Swan match box, mounted on its side in the same position as the standard Moto Parilla spring action unit. 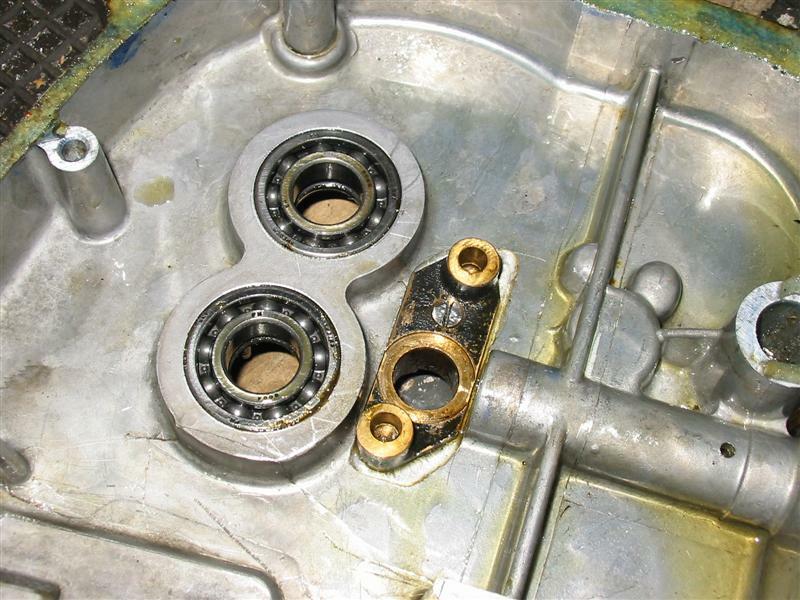 There was a very small bore oil pipe pinned to the inside of the crankcase tower connecting the piston housing to the main crankshaft oil delivery union. 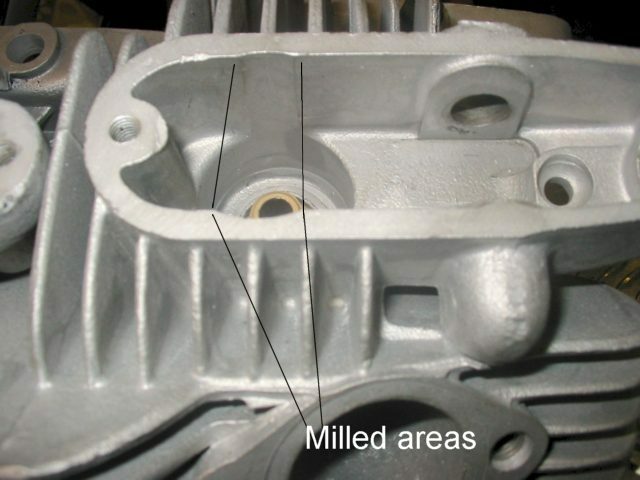 In place of the normal springs there were two small pistons located in the ‘housing’ which pressed against the back of the chain sliders, once oil pressure was obtained. This system for chain tensioning seemed to me to be well worth developing and I was seriously considering fitting the unit into our 250 engine; however, we were eventually discouraged from doing so by the Eng for reasons which I have now forgotten! – Perhaps he thought we were just running out of time? We reduced the weight of the standard frames by removing all non essential lugs, the seat extension arms and excess material from the swinging-arm pivot spindle plate brackets. We declined the option offered to have the frames strengthened by welding additional tubing from the top of the swing –arm spindle brackets to the top tube of the frame as this would have added weight and I did not see any need for this modification as we did not have the top spec Ceriani forks or Oldani brakes as originally planned – If we had fitted these higher spec components I have no doubt the added frame stiffening would have been required and would have been beneficial. The bottom yokes were lightened by machining 5 mm off from the underside of the yokes and by drilling out material from inside the yokes arms. The top yoke steel pressings were lightened by drilling. At all times we filled the forks with the highest grade fork oil we could find of S.A.E 25. Our rear suspension units were standard Moto Parilla parts but each pair were matched by testing 20 or more units on a compression and damping function rig Moto Parilla had installed on the main assembly line at the rear suspension fitting station. Wheels and brakes were again standard Moto Parilla units with the exception that we fitted Ferodo green racing brake linings and modified the wheels by drilling the hubs and spoke flanges to reduce weight and improve cooling – this also made them look more appropriate for a racer! All our wheels were fitted with the very latest Dunlop triangular section racing tyres. The standard MSDS seat bases manufactured from steel sheeting are very heavy so having brought some aluminium sheeting over from the UK to make three sets of rear racing number plates we had just enough sheeting left over to manufacture two seat bases in aluminium which were much lighter. I also found the standard seats to be very narrow so we made the new aluminium bases 30 mm wider than standard whilst still using the standard cover packed out with wider foam. We hunted high and low in Milan for a pair of suitable alloy mudguards to fit the Moto Parillas but had no success. Being anxious to complete all our work before setting off for the Ring we just had the standard steel mudguards stripped and brush nickel plated – at least they now looked the part! The exhaust down pipes were standard parts but in the case of the 125 we found a down pipe in Aladdin’s Cave with a bore 2 mm smaller than the standard 175 MSDS pipe and this we fitted to the 125. The down pipe and megaphone fitted to the 250 were standard Moto Parilla racing parts and in the case of the 256 we also found a ‘special’ megaphone in the Cave which we fitted. 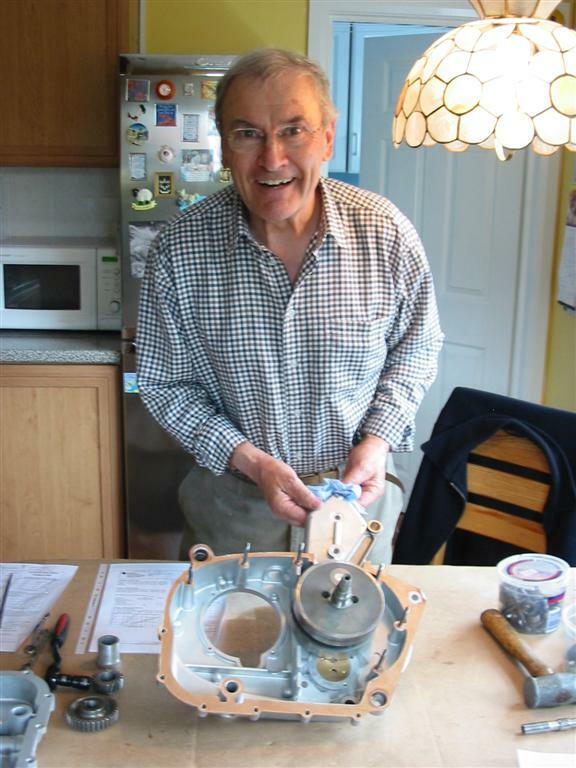 With regard to the assembly of our engines and gearboxes, I can do no better than to recommend readers to Mike McGarry’s comprehensive “Spannering” page in the technical section or this site. There were however, one or two engine build tips we picked up from our assistance which may be of additional interest. To ensure maximum mechanical efficiency and minimum friction loss within the valve gear, our assistants went to great lengths to ensure the rocker arm spindle centres in the cylinder heads were absolutely square to the crank case cam tower face when the heads were pulled down. They achieved this by fitting a small fixture (rig) resembling a cranked door hinge on top of the heads locating the fixture squarely to the head by screwing an extended dummy rocker spindle through the fixture into one of the rocker spindle apertures. The hinge section of the fixture was then dropped down over the cam tower and the head squared up to the face of the tower before the two lower cylinder head nuts were very lightly tightened down. The special fixture was then removed and the head inspected to see which of the studs and cylinder holes lined up the best (central with equal clearance all round) – once this was established the head was removed and a very thin wall steel tube was lightly pressed over the chosen stud end to a depth of around 10 mm into, and protruding from, the barrel. The matching cylinder head hole was then lightly reamed out to allow clearance for the steel stud ‘thimble’ which now acted as a dowel or locator pin whenever the head was removed and re assembled. As a toolmaker I expected our assistants to fit another ‘thimble’ over one of the other engine studs to ensure the head location but they did not do this? Nevertheless their system for squaring up the head always seemed to work! At last our bikes were more or less ready for road testing and having already overrun our planned stay with Moto Parilla we were anxious to get on our way to the Nurburgring, however, there was still one task we had to accomplish before departing – it was time to face up to the canteen cashier and receive the final bill for all the lunches we had enjoyed at Moto Parilla! Entering the canteen for the very last time with our assistants we collected our lunch from the counter in the usual way but there was no sign of the cashier on this occasion. We finished our lunch and just as I was beginning to think our luck was in I spotted the cashier marching into the canteen and coming straight towards us! As she approached the canteen fell silent but I could see she was smiling and when she presented us with a large bottle of Chianti and a box of chocolates instead of a bill, I could not have been more delighted or surprised. At this point, all the staff in the canteen started clapping and whistling which was I think their way of saying goodbye – to this day I do not know who kindly picked up the bill?